Torre degli Anguillara was built in the 13th century and owned by the Anguillara family, a noble family that controlled this neighborhood until the 15th century, as a defensive outpost overlooking the Tiber River. In 1538 it became the property of the family of Carbognano, which turned it into a stable, slaughter-house and cellar, so the residents of Trastevere called it "palazzaccio" (ugly, bad, horrible place). 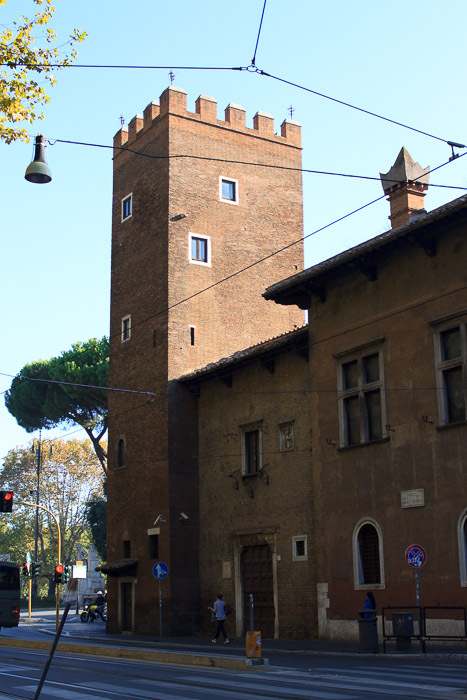 The tower is located just south of the area's most familiar landmark: the white marble statue of the dialect poet Gioacchino Belli, depicted in a frock coat and tall top hat, at the beginning of Viale di Trastevere. See all Torre degli Anguillara photos.